Clinton Vinson is a 25-year-old young man in optimal physical health. During the week he works day shift loading heavy freight onto cargo planes and in the evenings he is a much sought-after personal trainer at his local YMCA. His weekends consist of feats of strength, stamina, and mental endurance. So far he’s completed two Spartan Races, a Battlefrog 5K and Mud Run. He has a Tough Mudder and Spartan Super Race on his schedule in the next few months. Vinson would often find me on the fitness floor and ask me to help him stretch after his workouts. Finally, I convinced him to try a yoga class. Now, however, Vinson is a firm believer in yoga. He says the increased flexibility he’s gained from yoga has helped his workouts both in the gym and outside on the racecourse. Extreme sports are very strength oriented and often overwork certain muscle groups. Muscular imbalances can lead to injury both on the athletic course and on the yoga mat. Therefore it’s important that a yoga practice focuses not just on flexibility but also on stability. Like Vinson, many athletes are turning to yoga as cross training to improve their performance and to prevent injury. “And I’ll go on record here in case any macho man wants to laugh at me in a yoga class. Yoga can be a difficult workout. Even professional athletes are using yoga to perform better on the court and on the field,” said Vinson. The repetitive motion of running creates tightness in the hips and hamstrings, both of which can lead to low back pain. Runners also need to incorporate upper body and core strength exercises into their running schedule. From hands and knees, bring the right knee forward toward right hand, making the shin parallel to the front of the mat. 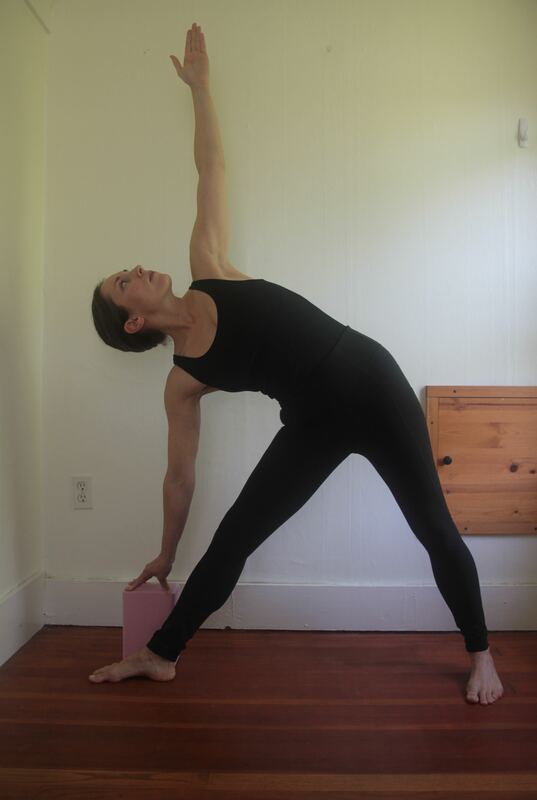 Gradually extend the left leg to the back of the mat to find more length in the pose. If your hips don’t reach the floor, place a block under the right hip for support. Never force the hips to drop, but rather allow deep breaths to encourage opening and release in the hips. The upper body can be supported with a bolster or blanket to encourage further relaxation. If full Pigeon Pose isn’t accessible or causes knee pain, try a supine Pigeon Pose. Lie on your back, cross the left ankle over the right thigh. For a deeper stretch, bring the right leg up to a 90-degree angle, holding behind the right thigh, allowing the left hip to open deeper. Although it’s often used to transition between asanas in a vinyasa class, Plank Pose is excellent to build core strength. (photo right) If full Plank Pose hurts your back, try dropping to the knees while still keeping the spine straight from the hips to the neck. Like running, the repetitive motion of cycling also can lead to an imbalance in the leg muscles. Yoga poses can counteract the stress in the back and shoulders due to the necessary seated and forward-leaning alignment. Kneeling on your mat with knees about hip-width apart, press your shins and tops of the feet into the floor. Place your hands on your lower back, fingers down, and begin to lengthen the spine pushing the crown of the head toward the ceiling. Keeping the neck in a neutral position, push through the pelvis to lean back. Beginning in Virabhadrasana I (Warrior I), straighten both knees. Hinge forward from the hips, stopping when the torso is parallel to the floor. Lengthen the front leg so that the hip draws back. Use blocks for support if your hands don’t touch the floor or the front knee wants to bend. A regular yoga practice will improve shoulder flexibility for a greater range of motion while also balancing strength in the upper body and lower body. Facing the long edge of the mat, step the feet wider than hip-width apart. On an exhalation, lean forward from the hip joint, bringing the hands to the floor or to blocks for support. Be sure the weight is evenly distributed between both feet and into the hips and heels. To increase shoulder flexibility, interlace the fingers and push knuckles towards the ceiling. Hold a yoga strap with your hands shoulder-width apart, if bringing the fingers together isn’t possible. Beginning in Tadasana (Mountain Pose), lift the left leg up and cross it over the right thigh. While balancing on the right leg, bring the left arm under the right arm and wrap the arms so palms touch. Raise the elbows slightly so fingers are reaching to the ceiling. Each of these sports requires unilateral movement favoring one side of the body and creating a muscular imbalance. Spinal twists in both directions are necessary for a strong, yet flexible torso. From Virabhadrasana II (Warrior II), straighten the front leg and extend to the side keeping equal length on both sides of the torso. Lie on your back with the knees bent. Pull the right knee into the chest and lengthen the left leg long on to the floor. Gently bring the right knee across the body to the left, either resting the knee on the floor or a block. Extend the right arm to the right, straight out from your shoulder, and turn the head toward your fingertips.